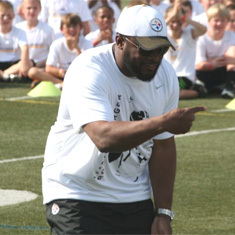 There’s still time to sign your child up to join Ben this summer for some football instruction and fun at his Annual Football Camp, sponsored by ProCamps Worldwide! But spots are filling up fast! 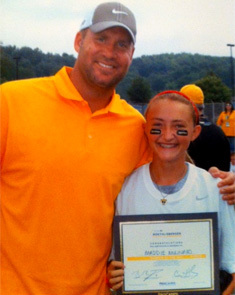 “I went to Ben’s camp the past two years and both times it was a phenomenal experience! He was so involved and you could tell that he loved every minute of the camp (he even threw a pass to every camper). I wasn’t too interested in the football learning aspect (because I don’t play football) but that part was greatly detailed as well! I learned a lot! I also was fortunate enough to have some of Ben’s teammates coach my groups as well! Overall it was a great experience that I would do again in a heartbeat. Those four days were some of the best days of my life!” – Maddie Mulinaro, the 2012 Day 1 ‘Camper of the Day’. (see photo below). ← Easter Wishes to Steeler Nation!